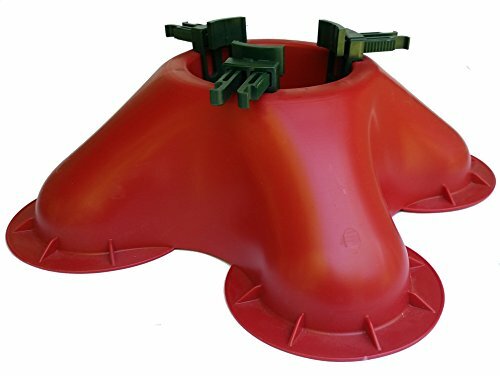 The Omega OM2 is part of the evolution of Christmas tree stands which takes the proven engineering of one of the most successful and effective stands to a new, smaller, less expensive design. Just like it's big brother; The Omega Tree Stand, it also uses the unbreakable, engineering grade resin clamps that provide 3000% more trunk contact than screw type stands. It has a 20-inch span and holds 2 liters of water. It can accommodate trees up to 7 feet tall and trunks just under 5 inches. It is patented and made in North America. Invented by a woman and is often called the Marriage Saver and the One Woman Stand. EXTREMELY STABLE- Accommodates up to a 7-foot tree and has a leg span of 20"
THE ONE WOMEN STAND- Allows one small person to set up a tree by themselves in under a minute. A marriage saver! If you have any questions about this product by Omega Plastics Inc., contact us by completing and submitting the form below. If you are looking for a specif part number, please include it with your message.